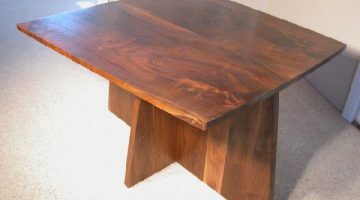 Dumond’s large rustic, contemporary, and modern custom kitchen tables are handmade from Walnut, Cherry, Bubinga, Maple, Oak and other unusual woods. These are unique, unusual, artistic, one of a kind, rustic, custom handmade kitchen tables made to order!!! One of a kind Rustic Claro Slab Walnut Custom Kitchen Table 42W x 65L x 30H. Place your order today. We have many custom kitchen tables on sale. Call for sale pricing. Our custom walnut kitchen tables are made of large slabs of walnut from around the country. We buy slabs wherever we can find the best material. Our large slabs make the most wonderful and unusual custom kitchen tables. Come visit us for a tour of our amazing custom slab kitchen tables….. It is worth the time. Custom kitchen table using bookmatched walnut slab top with matching slab trestle base. Our custom kitchen tables are unique, unusual, one of a kind and artistic. Spectacular Claro Burl Walnut Slab Custom Kitchen Table! 4′ Claro walnut burl slab custom kitchen table with walnut pedestal base. Hand rubbed hard oil finish brings out the beauty in this amazing top. Size 47″ W x 30″ H x 49″ L.
Rustic Custom Kitchen Tables and Custom Dining Tables Custom Made To Order. Our tables are custom, handmade, handcrafted, unique, unusual, one of a kind tables made especially for you. Let us build you a custom kitchen or dining table!!!! “The Greybill” Rustic custom kitchen table. 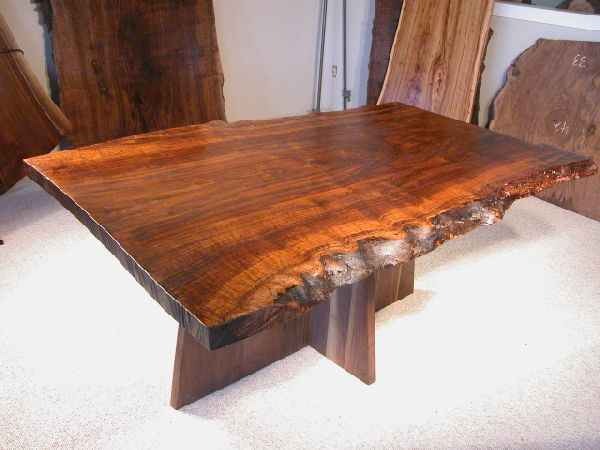 Cherry slab with Tulip wood butterflies make this rustic kitchen table a one of a kind. Rustic Walnut Slab custom kitchen table. One of a kind Claro Walnut Custom Kitchen Table. Place your order today for one of our beautiful rustic slab custom kitchen tables. Visit us to see our huge custom dining table inventory. Call for sale prices. 42W x 65L x 30H. 4×4 Sycamore Custom Kitchen Table. Unique, unusual, one of a kind, sycamore custom Kitchen table with Maple Base 48W x 48L x 30H. Place your order today, only one available. Call for sale prices. 8′ Bubinga Slab Custom Kitchen Table -On SALE Now!!! One of a kind custom kitchen table using a Bubinga top with maple base 32W x 96L x 30H. Ready for immediate sale. Call today to place your order. Only one available, first come, first served. Call for sale prices. Bookmatched Slab Walnut Custom Kitchen Table. One of a kind bookmatched slab rustic walnut custom kitchen table with walnut pedestal base. Smaller figured bookmatched Walnut Custom Kitchen Table. One of a kind Smaller Custom Bookmatched. Walnut Kitchen Table. 42W x 42L x 30H. Place your order today….we build custom kitchen tables to order.